Ahh, we have made it to a great time of the year! When is that, you ask? The time when winter is right around the corner? The time when all the leaves start creating beautiful portraits in the countryside? Maybe the time when every morning greets you with brisk cool air? Nope! We have made it to that time of the year when Dainese announces new products for next year. First up are three new gloves, not the most exciting gear to focus on, but arguably the most important. Let’s face it, good gloves allow good control over the bike, and good control over the bike can mean not testing out the safety of that shiny new lid. 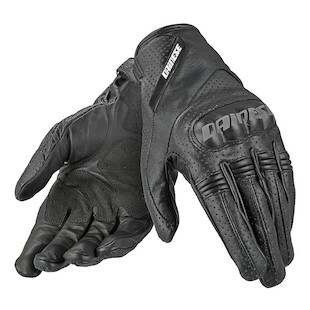 For any fans of going fast out there, Dainese have released the new Veloce Gloves. The Veloce are full gauntlet leather gloves that meet the new European certification standard. The gloves are made from cowhide leather with lovely, supple kangaroo leather in the palm that is reinforced at the base of the palm for additional durability. 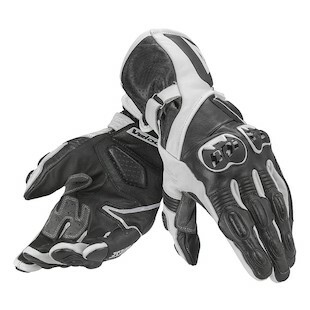 The Dainese Veloce feature polyurethane knuckle protectors and soft inserts on the fingers, and come in at a budget-friendly price - so beginner track rats and new street riders take notice! If a full gauntlet glove is not your style, but you are still looking for protection and good looks, then you need the Dainese Essential Gloves. These Essential Gloves are a short-cuff, perforated cowhide leather glove with TPU knuckle protection. The palm is reinforced with synthetic suede, and the whole glove is certified to the new CE standard for gloves. 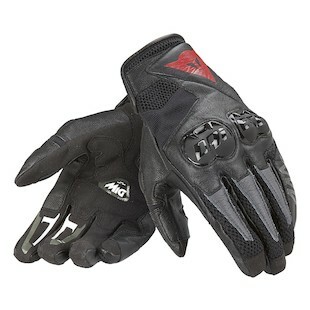 Essentially, if you are looking for a short leather glove for warm weather riding, Dainese has got your hands covered. Do you feel like a fighter pilot? Maybe you just really like Russian fighter jets. Or, maybe you feel like you’re in Top Gun whenever you fire up your bike (don’t lie, you know you think of that scene every time you pass an airport). If you answered yes to any of the above, you will be interested in the new Dainese MIG Gloves. These short-cuff gloves have a cowhide leather construction with incorporated mesh for warm weather comfort. The MIG gloves have polyurethane knuckle protection and use reinforced synthetic leather on the palm for greater durability. You like your hands. You use them everyday, and life would be pretty difficult if anything happened to them. Dainese is making is easier than ever to find the right pair of gloves that suit your riding style, match your bike, or complete that specific look you’re going for.